Property Size 2,434 sq. ft.
Coming in May: a new 8 to 10 person hot tub that will be available until August 31st! If you are looking for a great comfortable getaway that is walkable to downtown New Buffalo but still in a quiet location, this is the spot! Downtown Hideaway is an open and modern updated 4 bedroom 2.5 bathroom single family home that has been recently remodeled and the owners have truly not missed any of the amenities for the property. 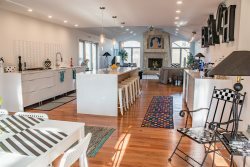 The house is located on a peaceful side street, 6/10 of a mile from the heart of downtown and only one mile from the large public beach in New Buffalo. The kitchen, dining and living area are a larger than expected open area that is perfect for a group of family and friends to all spend time together! There is very well equipped kitchen with tons of space for cooking and meal preparation, including lots of counter top space, a gas stove, two ovens (! ), all of which are recent and up-to-date. There is a long wet bar on the opposite side of the kitchen area with a beverage fridge and room for mixing drinks. There are several drawers full of wine glasses, martini glasses and such so get ready to have some fun! The fireplace is a gas start wood burning fireplace, nice and easy. The bedroom wing is just off the kitchen. There are two bedrooms with king beds and one with a queen bed, all new and comfy with great bedding. The adjacent spacious master bedroom suite is accessed from the living area and has a king bed, a gigantic walk-in closet, a new and beautiful full bathroom with a shower and tub and tons of space. The master bath is very large and has a walk-in shower and a vanity table. One of the most interesting features of this house is the fact that the master bedroom, second bedroom and the bathrooms are designed to be easily accessible for those with mobility challenges and have wide doorways with no sills. The grassy back yard has plenty of space and is accessed by sliding doors from the living room area. There is a table and cushioned chairs for outdoor dining and a cushioned couch for lounging on the patio. This is also where you find the gas grill, charcoal grill and the hot tub (Summer months only generally - please ask about hot tub availability if booking before Memorial Day or after Labor Day). Other great touches include two washer dryer sets, high-speed wireless internet, cable TV, great decoration and extra thought given to comfortable seating and beds. As mentioned, the kitchen is supplied as well as any vacation house we have seen! Back to the location; you are within a couple blocks of some fun casual restaurants like Jackie's Cafe and Rio's Mexican Food. The Famous Oink's Ice Cream Stand is just around the corner and the New Buffalo Farmer's Market is also just a few minutes walk from the house as well. Whittaker Woods Golf Course is only two miles away and has a bus that will come and pick up your group. Equilibrium Gym is just a very short walk from the house and they offer day passes and weekly passes so you can keep your fitness regimen while you vacation. What a great way to get away from the city and have a healthy fun time here in Michigan!